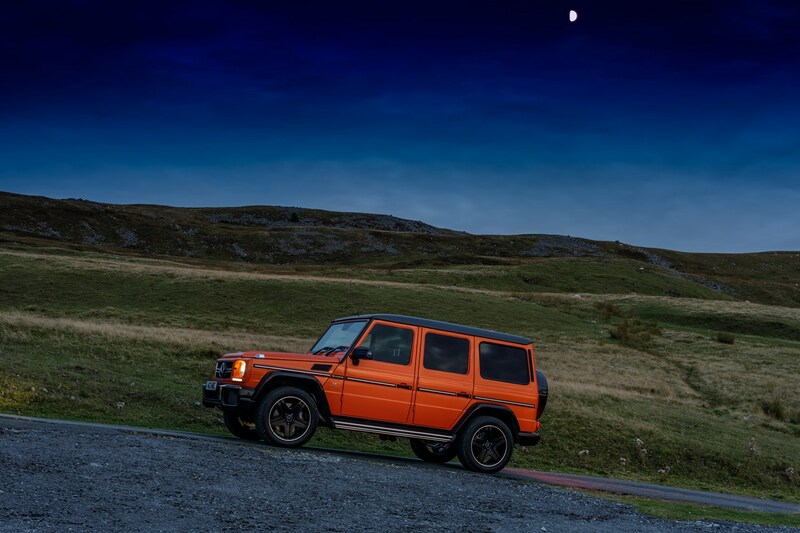 Those horror-inducing lines rang in my head as the keys to a Mercedes-AMG G63 plopped into my hand, just as I was about to take a week off to celebrate my 25th birthday in my Geordie homeland. The G was out there. Well, it was in the office car park, anyway. 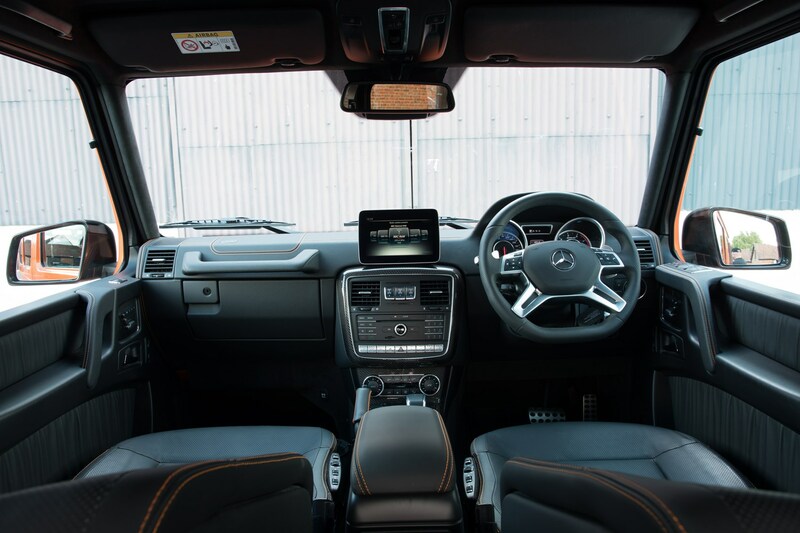 Other than both being Terminators, Arnie and the G-Class have more in common than you think. They're both from Austria and spent their early life building themselves a reputation as the ultimate tough guy but in their later life they've gotten both much more affluent and a little bit eccentric. 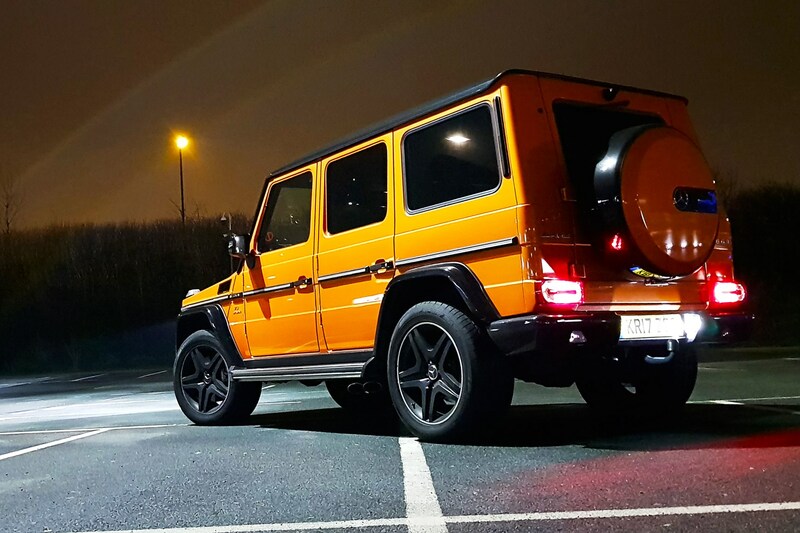 In the case of this 2017-year G63 'Colour Edition' in 'Sunset Beam' finish, they're also now getting on a bit and are both as orange as a Tequila Sunrise. 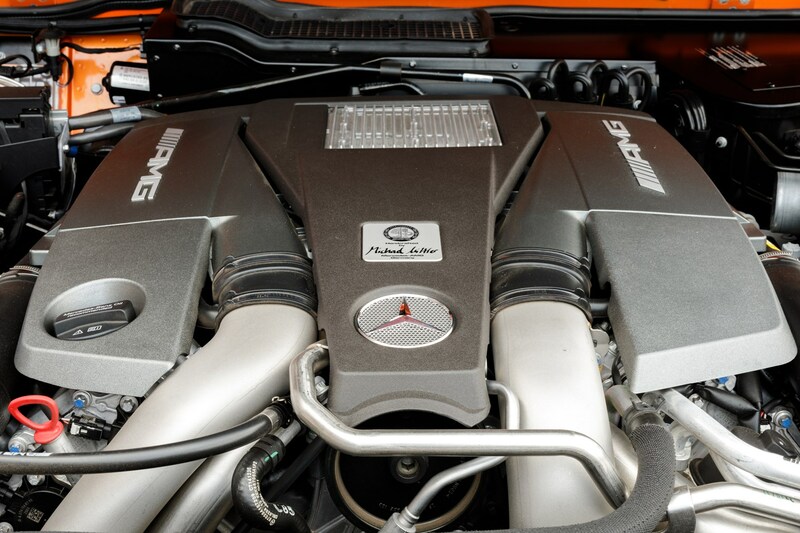 But the W463 G-Class is imminently about to shuffle off this mortal coil. In fact, its replacement has already arrived, so this was one of the final opportunities I'd have to experience an icon in its current form. A last hurrah. I digress. Let's start from the beginning. The G63 arrives at CAR's office about 20 minutes after I do. As colleagues from both CAR and Parkers filter in, it's the only point of conversation first thing in the morning. 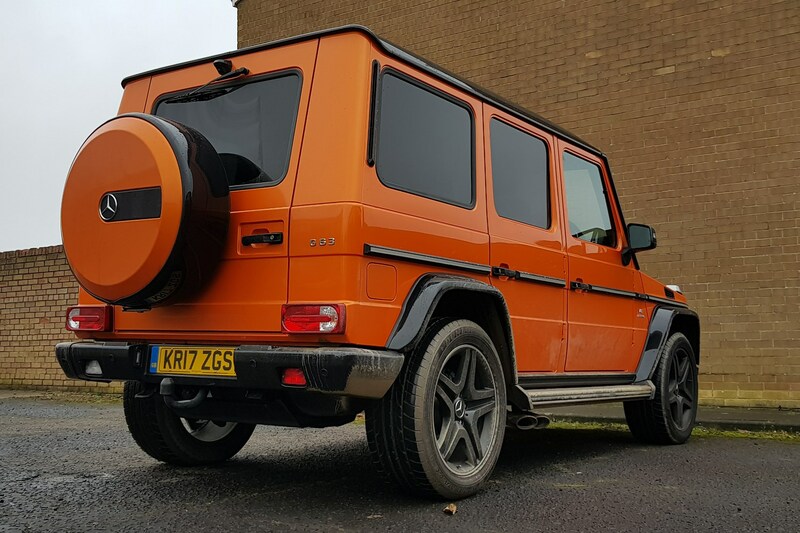 'Who on earth has booked in an orange G-Class?!' exclaims Parkers Vans editor CJ mid-laugh, which is responded to by me sheepishly raising my hand. My phone buzzes; 'your silly car has arrived', messages James Taylor as he walks in. He's not impressed. I pick up the keys and excitedly amble outside to our car park; it's dead ahead, slotted neatly next to my Swift long-termer. It's enormous, dwarfing the Swift completely. Surprisingly slim, but the bottom window line is equivalent to the Swift's roof in terms of height and its front bumper juts out like an anglerfish's underbite. Yikes. It's lunch time, and I'm itching to have a go. The G-class and I set a course for the nearest McDonalds, with online editor Curtis and Lawrence from Team Parkers tagging along. Clambering in requires genuine effort, and I quickly realise that the driving position adjustment is limited at best. Even with the seat back, the pedals are too close for my gangly legs, with the brake in particular jutting out considerably. Firing it up for the first time is enough to startle nearby birds, but blatting towards our lunch destination is even more satisfying. 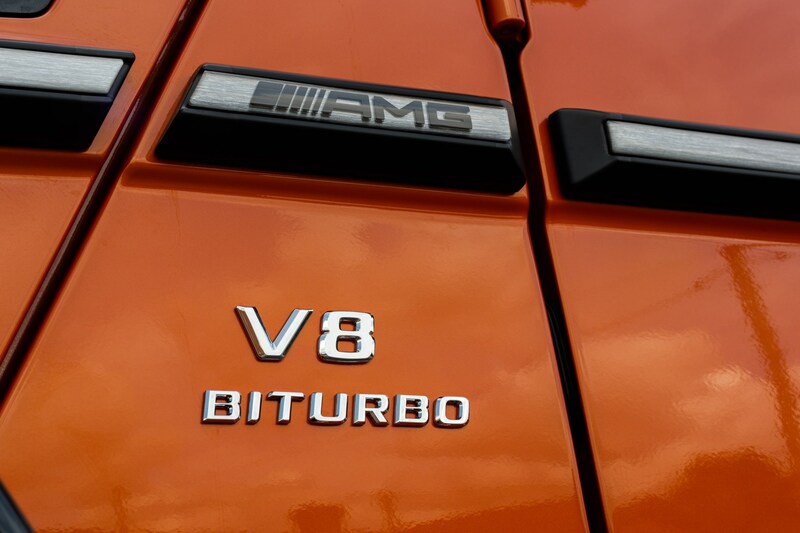 The 5.5-litre twin-turbo V8 has 563bhp and 561lb ft of torque at its disposal – plenty enough then to haul the G63's 2550kg kerb weight with noisy purpose. The long drive up to my Newcastle family home begins, with my expectations of it being a pig to drive in literally every situation beginning to dissipate. After a couple of hours of motorway cruising, it's clear the ride is bouncy at low speeds, but it smooths out at 70mph. Also, Merc's Distronic Plus adaptive cruise system is one of the slickest I've ever used. The only niggle is significant wind noise, but that's something to be expected when the car you're driving is about as aerodynamic as a brick smashing through a window. 'Jesus,' my mum scoffs, complete with a raised eyebrow. She was pre-warned of my week's wheels, but the reaction is still one of shock when up close. 'You might need to use the grabhandle to get in,' I point out, which gets another scoff directed my way. But she genuinely has to, after briefly struggling with her entry strategy. Once settled in, I talk her through getting comfy. The seats are pretty supportive as they are, adjusted a number of different directions using the door-mounted switches, but that's not all. The G also pumps compressed air into certain parts get you further set up, with the bolster under your thigh, two areas of lumbar support and side bolsters there to further hug, support or smother you. 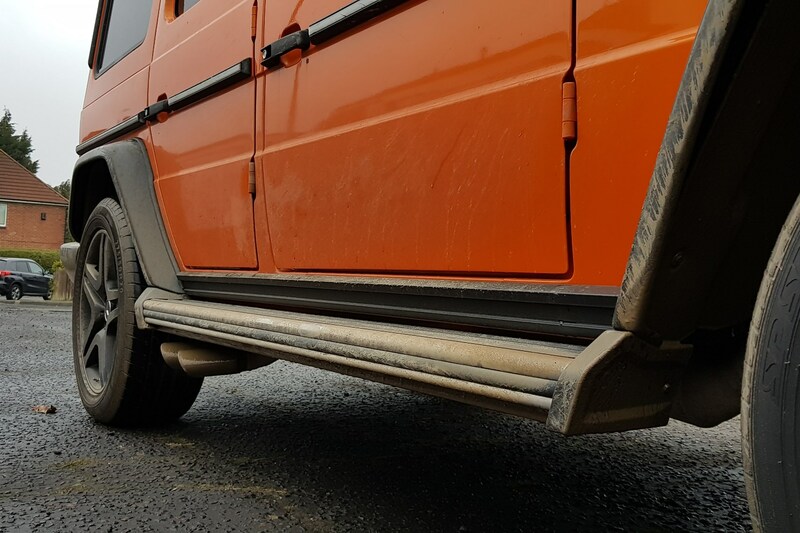 The G63's huge boot comes into play after a bountiful supermarket trip, but it's a good thing I parked it nose-in; the side-hinged door wouldn't have done us much good otherwise. You also have to properly slam it for the latch to fully engage – something I quickly found out when the reversing camera decided not to work due to the boot being 'open'. Irritating. It had to happen eventually. Off to the fuel station for the first time of the week, ahead of a drive into rural Northumberland with family. There's a quarter of the G's 94-litre tank remaining, and it has to be filled with 98 octane, so 69.64 litres of V Power pile in, at the heady cost of £91.86. I sense this might not be the only fuel stop of the week. The family and I return from our jaunt near Rothbury, slightly aching from our hilly walk up and down the craggy landscape, piling into the G and heading back to Newcastle. Now, the roads connecting Rothbury to the nearby motorways are rather twisty, National Speed limit affairs. They're something I'd usually revel in - and terrify my passengers about - when driving anything that's remotely a good steer. 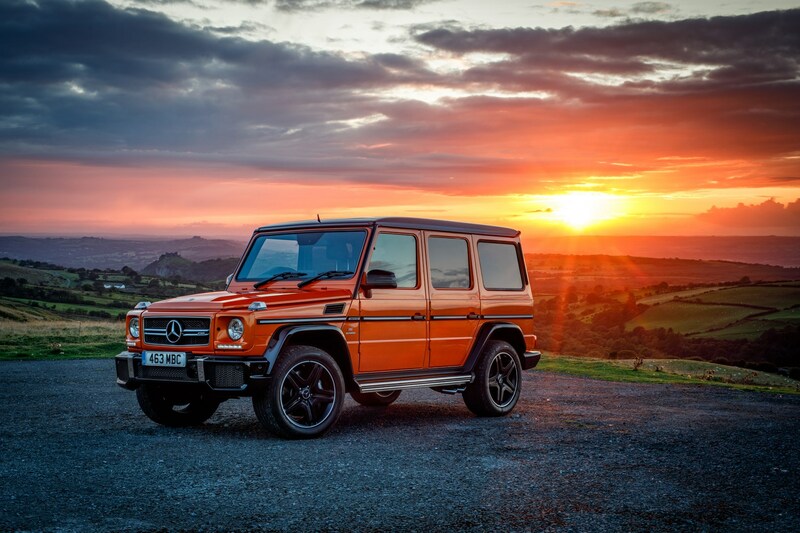 The G63... is not a good steer. There is a steering wheel, but it seems to have very little with the car's overall direction. Couple that with the G's towerblock-like, top-heavy construction and the G's catastrophic body roll becomes immediately apparent. So much so that I can't actually do more than 40mph down most of the roads, and I'm actually holding people up. Even trying to be gentle around swooping bends requires significant concentration, and there's a fear of either rolling or at the very least upsetting my passengers to the point of vomiting while I'm sawing at the vague wheel. 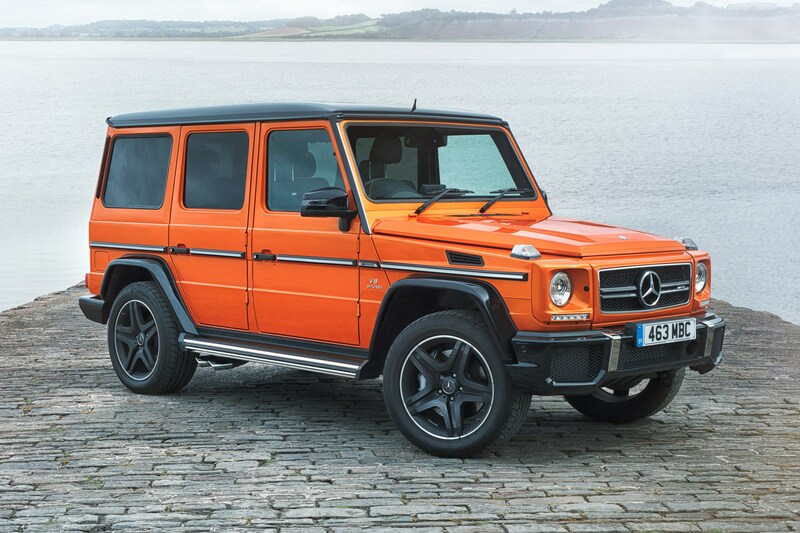 Honestly, the G63 tilts from side-to-side as much as a ferry in choppy seas. Not for the seasick. 'Why would anyone ever need a car like that here? It's absolutely unnecessary.' Quite literally the first thing out of my mate Ted's mouth – we've known each other so long we don't really do 'hello' any more. I'm inclined to agree. 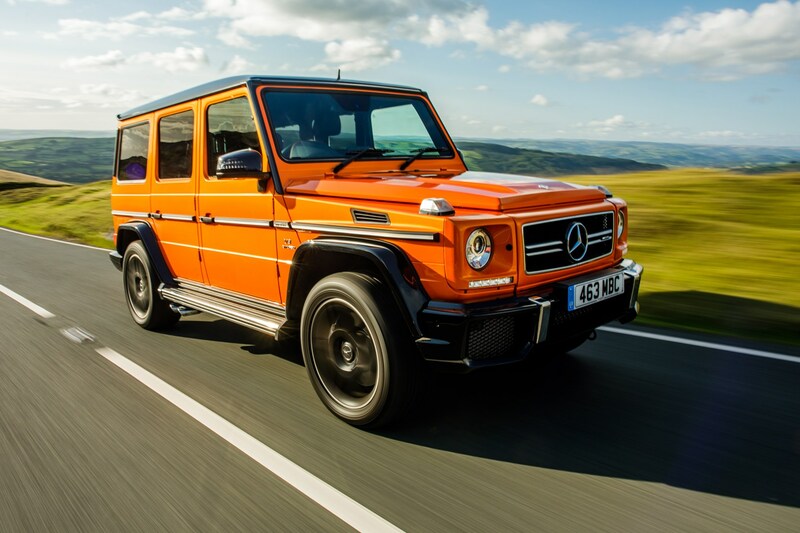 Absolutely no one needs a G63 in the UK – especially not an orange one. 'But that's not the point,' I weakly argue, 'it's just meant to be a bit of fun.' 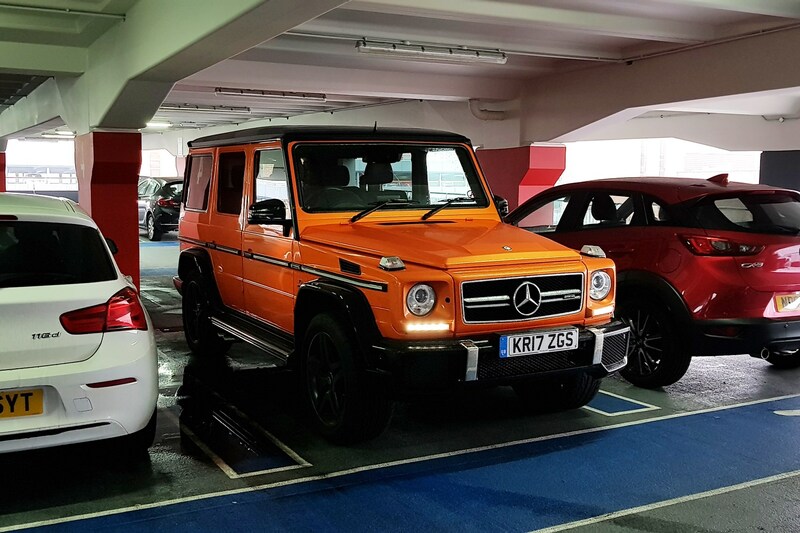 There's no denying it, though; a G63 Colour Edition is for YouTube vloggers who've done well for themselves, footballers or particularly showy Dubai rich kids. And me... obviously. Happy birthday to me; it goes from a balmy 20-degrees the previous day to around five with monsoon-like rain conditions. 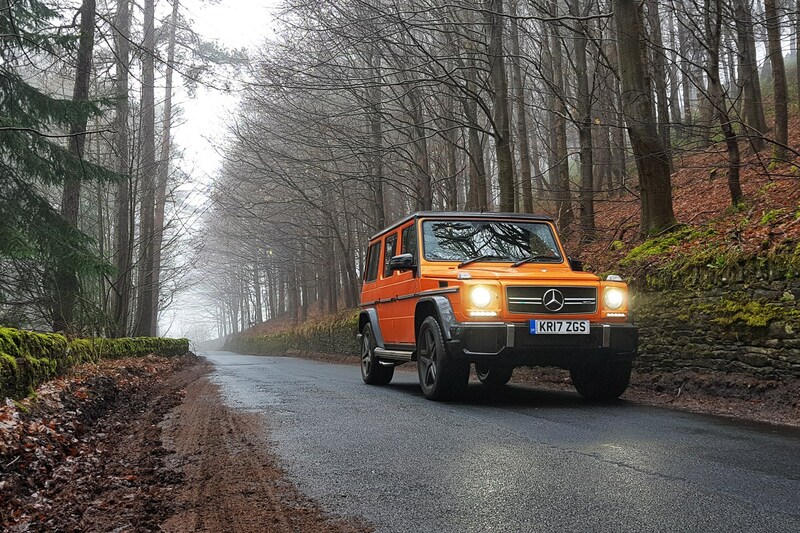 Still, the G63 ploughs on unphased, driving through sudden fords and deep puddles in the road like it's nonchalantly swatting at flies. The windscreen wipers are comedically small, springing into action vigorously on the near-vertical windscreen. I'm bored, after not doing much all day. I've been itching to take some pics of the G at night, so grab the keys and wander out. It's quiet this evening, which just highlights how loud the door locks as I blip the key, with a crude thunk echoing off my neighbour's walls. It also gives me an excuse to actually try to drive it like a 'regular' AMG should be driven. 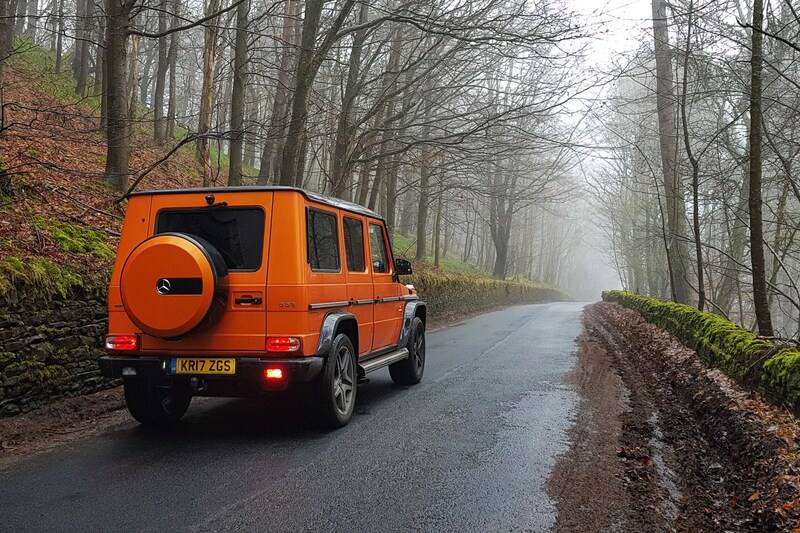 It's insanely fast and makes one hell of a fuss as it goes about accelerating – just as an AMG should – but I really can't stress enough how little handling is the G63's priority. So much so that I get a little over-zealous with my entry speed into a sharp corner and have to brake mid-steer, forcing the G to kneel and tilt violently to the right as I clamp my hands to the wheel for dear life. If I steered any more in that split second, there would have been a roll; if I steered any less, there'd be a G-Class-shaped hole in the hedgerow. Won't be doing that again in a hurry. Second fuel stop. Another 43.82 litres of V Power and my wallet drained of another £57.80. Ouch. This is a tight squeeze. Blindly swooping the G towards a shopping centre's multi-storey car park, I have forgotten how tall it actually is. Right up until the moment I'm sat ahead of a height restriction with a queue of cars behind me. Bugger. It's the most tentative I've ever driven into a car park, creeping under the 2.1m height measurement before entering, mid-wince. But all is well - the G's height is 1938mm - allowing me to let the V8 burble echo off the concrete walls as I search for a space. As I do, I count three people with their phones out snapping pics. You never get used to the attention. I go see my friend Ted again. He's just moved into a new-build house, with construction crews meandering around the new estate dumping all sorts of dust, silt and mud on the roads. The G comes out the other end suitably spattered, but it wears it well. 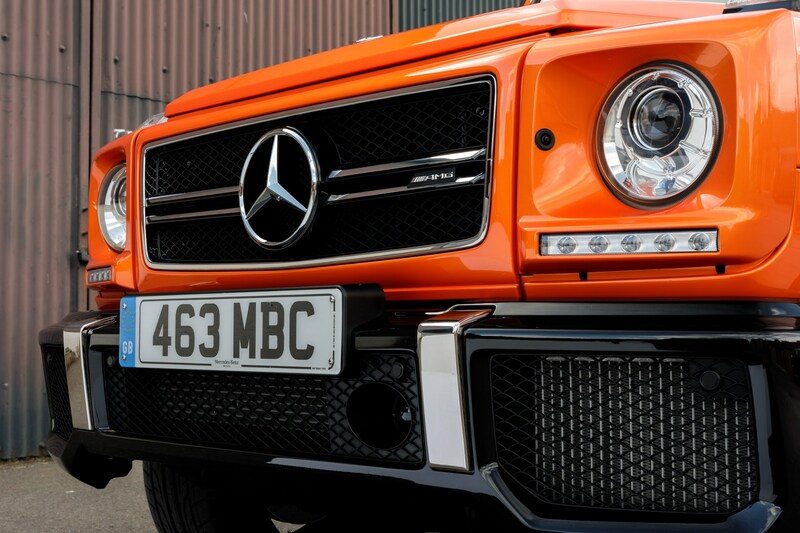 A G-Class should always look dirty – you're not doing it right if it's clean. Eager to get more pics, I'm Northumberland-bound again scouting out for some epic scenery. Only it's super foggy in the hills, so when I arrive I can barely see more than 50 feet in front of me. Lame. Third fuel stop of the week. Another 54.36 litres flow into the G's gaping maw after my foggy jaunt in the hills yesterday, and another £71.70 deducted from my account. Ouch. 'Have you seen what you're driving? ', I nod. 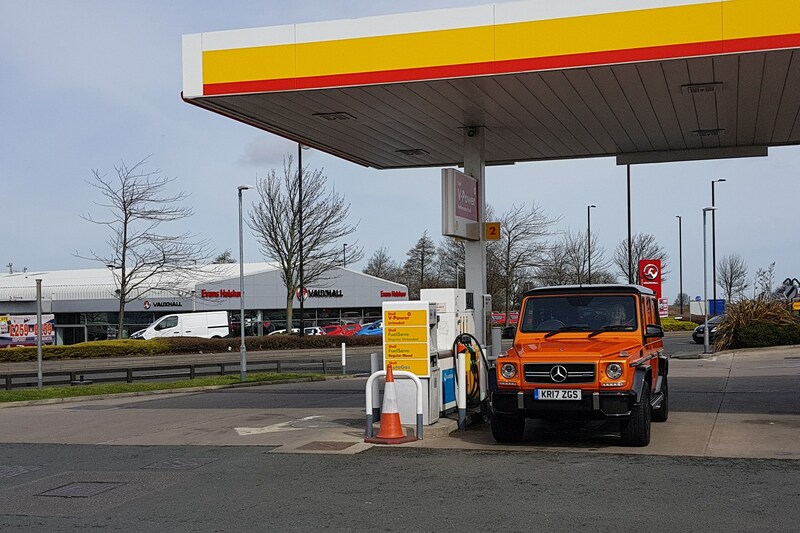 He laughs, 'yeah, but you don't see many G63s around.' Especially not in orange, I guess. 'Oh my God, look at the state of this! ', laughs friend Josh. I'm picking him up to go for food in Newcastle, and the whole journey is spent laughing at the silly details of the G; the left-hand drive-biased handbrake, the compressed air in the seats, the noise and the body roll. He also points out how many people are looking at us, with even a few less-than-reputable looking folks eying it up like a target. The week off has come to an end, and I have to drive it back to Peterborough and swap cars with Rebecca Wilshire, our designer. The cruise is super-easy and feels like it goes by in minutes, with the G settling into the motorway schlep. Which is advantageous, as I'm knackered and want as little fuss from the journey as possible. Getting into my Swift long-termer, after Becca burbles the G63 away, feels alien. I've become used to the lofty, upright driving position, vague steering and body roll but there's none of that back in the Suzuki. It's been fun, G-Class. You're rude, crude and lewd but what a laugh; there aren't many other cars that have made a week off so silly. 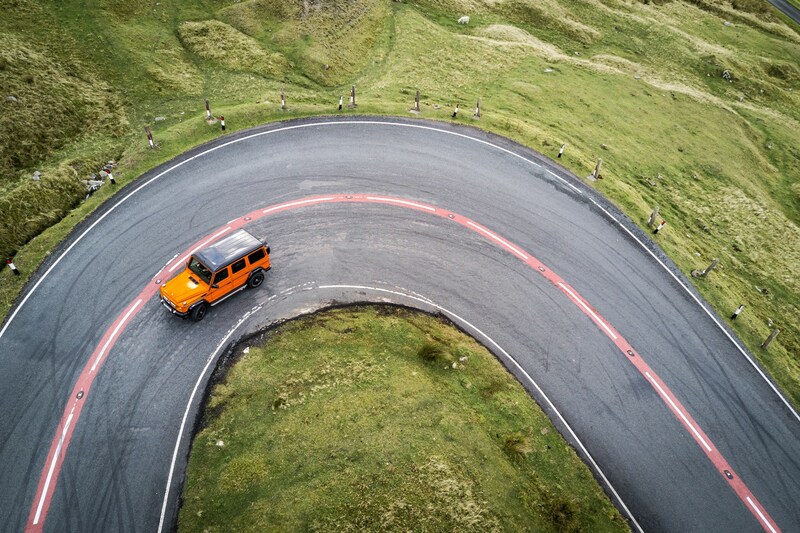 Here's hoping the next-generation G63 is just as mad. 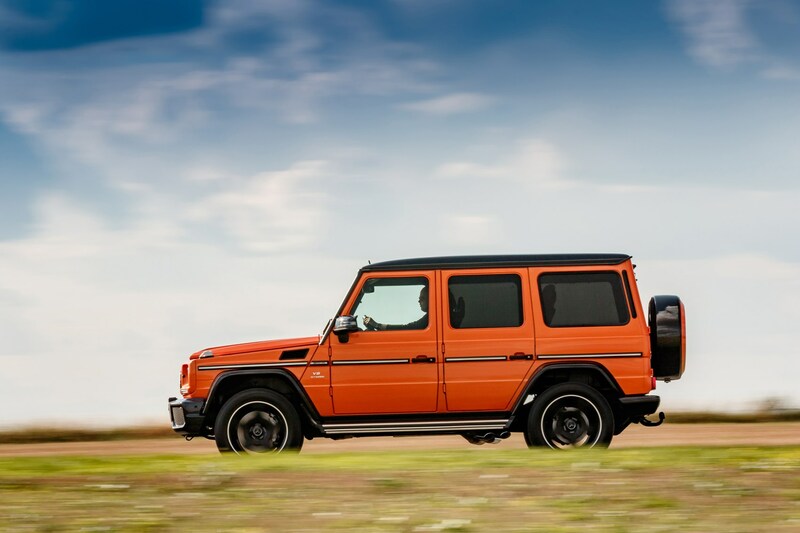 It's probably with good reason that the G63 is so expensive to buy in the first place, as those blessed with fat wallets won't even bat an eyelid. These won't be the most accurate figures, as I wasn't actively noting exact mileage numbers from start to finish. But I spent £221.36 on fuel over the course of a week, pouring 167.82 litres in the G's tank. My rough estimate is around 600 miles of distance travelled, equating to 16.3mpg – not far off the car's around 14mpg estimates, nor the claimed figures of 20.5mpg.